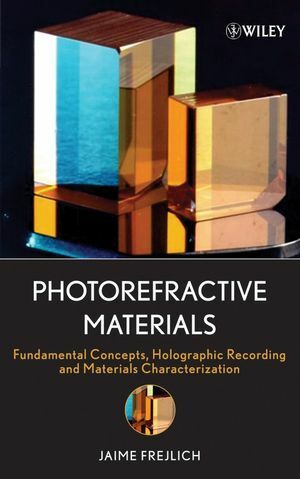 Photorefractive Materials presents an overview of the basic features and properties of photorefractive materials, covering a wide array of related topics. It provides a coherent approach suitable for introductory and advanced students seeking to learn or review the fundamentals, as well as senior researchers who need a reference while investigating more specialized areas. Jaime Frejlich graduated as a chemical engineer at the Universidad de la República, Uruguay (1973) and earned his PhD in physics/optics at Université Pierre et Marie Curie in Paris, France, in 1977. He has been a professor at Universidade Estadual de Campinas, Instituto de Física do Laboratório de &Oacute;ptica in Brazil since 1978. Professor Frejlich has published more than eighty scientific papers in specialized journals. His present research interests are in photorefractive materials, effects, processes, and applications. 1.1 Light propagation in crystals. 2. PHOTOACTIVE CENTERS AND PHOTOCONDUCTIVITY. 2.1 Photoactive centers: Deep and shallow traps. 3. RECORDING A SPACE-CHARGE ELECTRIC FIELD. 3.1 Index of refraction modulation. 3.3 First spatial harmonic approximation. 4. VOLUME HOLOGRAM WITH WAVE MIXING. 4.1 Coupled wave theory: Fixed grating. 4.2 Dynamic coupled wave theory. 5.1 Coupled wave with anisotropic diffraction. 5.2 Anisotropic diffraction and optical activity. 6.3 Self-stabilized recording in actual materials. 10.1 Measurement of Vibration and Deformation. 11.2 Fixed holograms in LiNbO3. A DETECTING A REVERSIBLE REAL-TIME HOLOGRAM. B DIFFRACTION EFFICIENCY MEASUREMENT: REVERSIBLE VOLUME HOLOGRAMS. B.3 High index of refraction material. C EFFECTIVELY APPLIED ELECTRIC FIELD. D PHYSICAL MEANING OF SOME FUNDAMENTAL PARAMETERS.